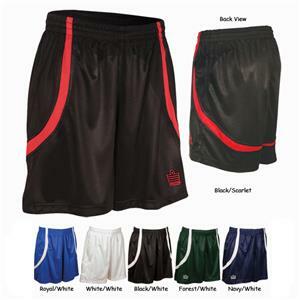 Admiral Women's Genoa Soccer Shorts - Closeout. The Women's cut version is standard Women's cut length and fit using Admiral's 100% soft polyester Vapor Draw fabric, set in Quick Dry mesh inserts that wrap from the front to the back for superior styling. Elasticized waistband with self colored inside draw cord. Unlined, except for white which includes a full mesh liner from waist to hem. This product is currently out of stock. Please check back at a later time. The Women's cut version is standard Women's cut length and fit using Admiral's 100% soft polyester Vapor Draw fabric, set in Quick Dry mesh inserts that wrap from the front to the back for superior styling. Elasticized waistband with self colored inside draw cord. Unlined, except for white which includes a full mesh liner from waist to hem. Great product, very pleased with quality. Very durable material. Fit runs perfect. Comfortable. Solid color with no fading or shrinkage.